The Queen is Dead... Long Live the Queen? Oh dear, where to start. First off, this story is not fresh in my memory because we have been away from the Geek's Quad for a week for our annual trek to Kentucky to help our daughter with her vendor booth at BreyerFest. We had a great time and she had a very successful year, but I did not write my next blog post as I had planned on during our time away. So now, I need to think back to several weeks ago to when this saga began to start this tale of woe, frustration and confusion. You may recall that when I was first contemplating setting up a bee hive, I decided I wanted to be a bee-haver not a beekeeper. The difference being that, in my research, I discovered that beekeepers seemed to obsess over their bees and it seemed to me that they often micro-managed what was going on in their hives. With our desire to live as self-reliantly as possible, I also wanted our bees to have the same mindset. I have just started to open the hive for inspection. The roof and top boardhave been removed. through the spaces in the queen excluder. Things were going quite well from the first day we moved the bees in. Our bees are friendly, docile and quite easy to work with compared to stories I have heard from others new to the world of beekeeping. I would periodically open the hive to see how the bees were progressing in building comb on the frames, and as the brood box became fairly full we added a second brood box. Our overall plan for the summer was to allow the bees to fill the frames in this second brood box with comb that they would use to grow more brood as well as store honey for themselves for the winter. When this box was near full, we would add the honey super at the top of the hive above the queen excluder. The queen excluder is a screen-like shield that allows worker bees to move freely up into the honey super to fill it with honey (for us) but the queen can not fit through this divider so she can not lay eggs up in the frames where you plan to harvest honey from. The capped cells in this photo are filled with honey. I checked in on the second brood box a few times and saw the bees were busy building comb. I then decided to do a more complete inspection and started by pulling out the frames one at a time and my untrained eye saw that the frames were very full and many of the cells were capped. I was very happy as it looked like we were ready to put the honey super on to start collecting honey for ourselves. I then decided to take off that second brood box and inspect the original box as well. I lifted the top brood box off. Now this is a medium box, which is shorter that the original deep brood box, but I was surprised at how heavy it was from all the honey now in the eight frames within it. Again, this made me very happy, but as I started loosening and lifting frames from the lower box I became more and more concerned. The comb on all these frames was almost empty! There was a bit of uncapped honey in some of the cells but no capped honey (full cells the bees had closed) and no cells that had any signs that the queen had laid eggs in them. I had never seen the queen in the hive, but she is often very hard to spot with the thousands of bees moving around on all the frames so I had never been concerned about it. But now, the lack of any sign of reproduction was a huge concern. Worker bees hatch in 21 days and drones hatch in 24 days so that meant the queen had not laid in at least that long. 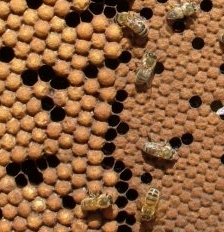 I was also seeing queen cells in the honeycomb along the bottom edges of the frame. Later on, in all my research, I would learn that this meant the hive was trying to make a new queen and the position of the queen cells indicated it was because there had been a swarm. But wait, I am getting things out of order.With the lack of brood, I was pretty sure the hive was queenless, but I did not know the reason When I emailed the person I had purchased my bees from and described the situation he was fairly certain that the bees had swarmed and that the new queen that was left behind in the hive had not survived. When a hive becomes too crowded the bees will swarm. When this happens the current queen and about 60% of the worker bees leave the hive for a new location. I did not think this had happened because (1) we had just added a new brood box so there was a lot of new space and (2) there were still lots of bees in the hive. However, on a recent inspection, I had seen a bee in the 'attic' of the hive above the queen excluder that looked significantly longer than the other bees. Being new to this, it did not register at the time, but with Alan and I both researching trying to figure out what was going on we learned that, when getting ready to swarm, the bees will starve the queen so that she will loose weight and be able to fly again. That bee I saw was probably the svelte queen bee that could now fit between the slots of the queen excluder. only produces drones, there will be no worker bee cells. So, our best guess, is that our bees swarmed and the new queen did not survive either her hatching or more likely, her maiden flight which is where she mates with drones before returning to the hive to lay thousands of eggs for the rest of her life. Since I did not catch this right away, our hive was in dire straights. We were up against the clock because if a hive is queenless for too long a worker bee will become a laying worker. This means it will start laying eggs, but it will only produce drones. With no more worker bees being hatched the hive will not be able to sustain itself. However, if you try to replace the queen after a laying worker has been established the laying worker will most likely kill the new queen. My best chance for success was to either introduce a new frame of brood comb into the hive. This frame would have freshly laid eggs from another hive that the bees in my hive would select eggs of the right age to create a queen from. I could also purchase a new queen, place her on a new frame of comb from another hive and place it in our brood box. This second option would actually improve my chances because the hive would hopefully accept the new queen and we would have reproduction starting immediately, or if they did not accept the queen we would still have the fresh eggs from another hive for them to create a new queen which would delay reproduction by a few weeks. 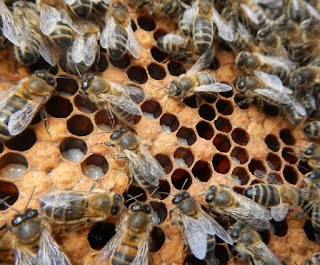 I order a new queen bee and as the next evening was our weekly meeting of our self-reliance group I explained our dilemma in hopes of obtaining a frame of brood as we have several beekeepers in the group. Unfortunately no one offered a frame to help save the hive. Alan offered some cash to help sweeten the deal (no pun intended) but we still had no offers so all we could do was wait for Queen Buttercup to arrive by priority mail, install her into the hive and are hoping for the best. during our test to ensure the hive was queenless. Prior to establishing Queen Buttercup into her new kingdom, we had a test that would indicate if there actually was still a queen inside of Clive (the hive). Now that we had a queen in our possession, we could place her cage on top of the frames in the brood box and see how the bees reacted. In any case, they should show a lot of interest in the cage and many should rush over to it immediately. The test would be based on the attitude the bees had towards the cage. If they climbed all over it but were friendly and curious then the hive was truly queenless and they were looking for a new queen. If, however, the bees were acting defensively and attacking the queens cage then we were wrong and there was actually a queen somewhere within the hive. We passed the test in that the worker bees were friendly towards Queen Buttercup. the candy plug to free their new queen. When installing a new queen, they are placed in a small cage with a candy (marshmallow like) plug. It takes several days for the bees to eat through this and free the queen. This delay allows the bees to become acclimated to the new queen's pheromones and accept her into the hive. Her Royal Highness had been shipped in the queen cage along with six attendants. Her ladies in waiting are worker bees who care for her. Unfortunately, when I removed the frames in the hive to adjust the space for her little cage I saw larvae in some of the comb cells which means we now had a laying worker bee. I also saw a high number of drones in the hive, higher than would be expected for a normal hive, which also indicates we have a worker bee creating drones. Nonetheless, I am still holding out a glimmer of hope. I did check the hive one more time before we left town for a week. I wanted to confirm that Queen Buttercup made it out of her cage. At first I thought she was still in there because the cage was full of bees when I took it out from between the two frames we had wedged it between, but then I saw the candy plug was gone and there were just a lot of bees in general going in and out of the little box. We had paid an additional nominal fee to have Queen Buttercup marked so that we could spot her more easily in the hive. When she arrived, I was a bit surprised to discover that she had been dabbed with yellow paint. Really? A yellow dot is supposed to make her stand out from the other bees? I then found out there are five colors used to mark bees and that one of the five colors is used depending on the year and yellow is the color for 2017. We still have not seen the queen, they can be very elusive moving from frame to frame as you pull the frames from the hive to inspect them. I also do not like to handle the frames too much because there is always the chance of squishing the queen between two frames as you slide them back in place. It would be a shame if the queen just happened to be moving between the edges of two frames as you slid them together to insert another frame back into the hive. The chances are slim, and I always move the frames back into place slowly so the bees can move out of the way but it still can happen. Sorry, I'll get back to the story. Back to that last inspection before we went out of town. The top brood box was still all capped honey. Most of the frames are quite full and it is very heavy to lift off to get to the original brood box. In the original brood box, I wanted to inspect the frames in the center as that is where the queen will usually start laying. First I pulled out an edge frame as this give me room to maneuver the other frames more safely without harming the bees. With the edge frame out of the hive, I can slide the next frame over and and then pull it out. I have learned that the side of the frame facing the center of the box tends to have more bees and more activity than the side facing the outside edge. Given the fact that there are hundreds of bees on the frames as you pull them out, it can be a bit challenging to move the frame around to be able to get a clear view of what's going on. slight dome while drone cells will have a higher dome. As I reached the frames at the center of the box my hopes began to rise. I was seeing a mix of cell types within the comb. Capped honey has a cap on the cell that is slightly concave and capped drone cells have a pronounced dome shaped cap on their cells. What I was looking for were capped worker bee cells, these would be evidence that Queen Buttercup was alive and producing worker bees. And yes, I am fairly certain I saw worker bee cells. They can sometimes be confused with capped honey because, while not concave, they appear to be flat topped or very slightly domed. 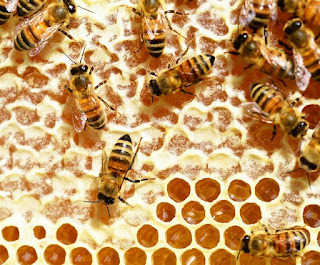 But as the worker bees are smaller than drones, the cells containing workers do not have the high domed caps like the cells containing drones. frames for inspection in the upper brood box and found more worker cells. So, in summation, the past few weeks have been a very high learning curve. It has been stressful - we have learned how attached we have become to our bees. It has been frustrating - every time we thought we had things figured out we would go up to the hive to confirm some research and realize things had changed or were not what we originally thought. And, it has been a needed reminder - I once said I wanted to be a bee-haver because I wanted our bees to be more self-reliant, like us. And yet, as I reflect back on this whole saga, the biggest frustration was we dropped our self-reliance and looked to others for help and it was not there. During our road trip last week, Alan and I had long hours to discuss many things and one of those was plans on how to avoid this in the future. I still want to be a bee-haver, I don't want the bees to become a consuming hobby, but in order to be a more self-reliant endeavor we need to have two hives. Had we had another hive we would have had frames of brood we we were looking for to transfer into the failing hive, and even if the hive still failed we would have a second one that we could split. Ever since we started down the path of self-reliance, a favorite saying of Alan's has been 'two is one and one is none. '. This basically means you have to have a back-up for everything that you need. If you only have one option and it fails, you are in trouble. We have always designed our various system based on this principle, and while the bees are not a necessity, they are important to us. And so, we have made a decision and I would like to announce that next spring Clive (the hive) will be getting a baby brother! congested as the garden matures. The gardens are definitely in full swing, and as usual, I did not get them fully planted. I did get a lot closer to every bed and space being planted than in past years, but I have a few raised beds that still need dirt in the north garden and I bought a few more kiddie pools to add into some open spaces. I plan on doing some late summer/early fall planting so these areas may still be utilized. But for now, let's see how everything else is doing. In general, the spring and early summer has been cooler and wetter than average. We have been getting rain every week which has been keeping our water tanks full and while I still need to go out and water on a fairly regular basis, I mainly have to concentrate on the containers as they dry out much more quickly than the raised beds. This is looking down into the bottom garden. It's hard getting an overview photo of the gardens. This year the gardens feel like much more of a juggling act than in past years. I believe this is because that as they expand in size each year I need to better track what needs to take priority on a daily basis. I have learned this year that I need to stop myself from multi-tasking when I enter any of the gardens. You see, I always head out to the gardens with a purpose. It may be to water, to weed, to harvest various produce or to go to battle against squash bugs; but once there, I am assailed with a variety of tasks that need to be done and soon I find myself stopping in the middle of my intended task to 'just do this' and 'just do that'. Before I know it, gardening time is over (it is either too hot or too dark) and my original chore is left half-done. One solution that I have found that helps me to stay focused is that I have buckets to carry the tools I use for various tasks - one holds what I need for harvesting, another holds items for staking and pruning tomatoes, and my most often used bucket holds my arsenal against squash bugs. What I keep in these buckets changes as the garden progresses and I repack them for specific projects, but making sure I am equipped for my specific project (and not for others) helps me stay on track. While out there each day, I do assess what the next priorities should be as they can change on a daily basis. Back in late April, I took you on virtual tour of gardens as they were being planted. So let's go and take another spin around the gardens to see how they are doing and I will tell you about some of the things we have been doing for the care and feeding of our plants. We'll go in reverse order from the last trip, we can stop to say 'Hi' to the bunnies and then head on over to the north garden. The thermostat is in the upper left corner of the photo. You'll see we added the fans back into the rabbit area for the summer. The heat can be hard on the rabbits, much worse than cold weather. Alan has wired in a thermostat so the fans will automatically turn on at 80 degrees. They will also turn off when the temp again falls below 80 in the evening which saves us a trip out at night amongst mosquitoes and June bugs. During summer heat waves we also fill two-liter bottles with water, chill them in the fridge, and place them in the rabbits' cages to help them keep their core temperatures down. the new berry bed covers. And here we are at the north garden. The first thing you probably notice is the addition of the 'covered wagon' on that raised bed at the end of the row. That is one of the new berry patch covers I made out of mosquito netting and pre-cut lengths of PEX pipe. Originally I was going to use PVC pipe for the arches holding the netting, but when I was at the store I tried bending the PVC so that the ends would fit into the width of our beds (30 inches) and discovered that the PVC was too rigid to be able to bend it into this much of an arch. So I started wandering around the store for another idea, which is how many of our problems are solved. 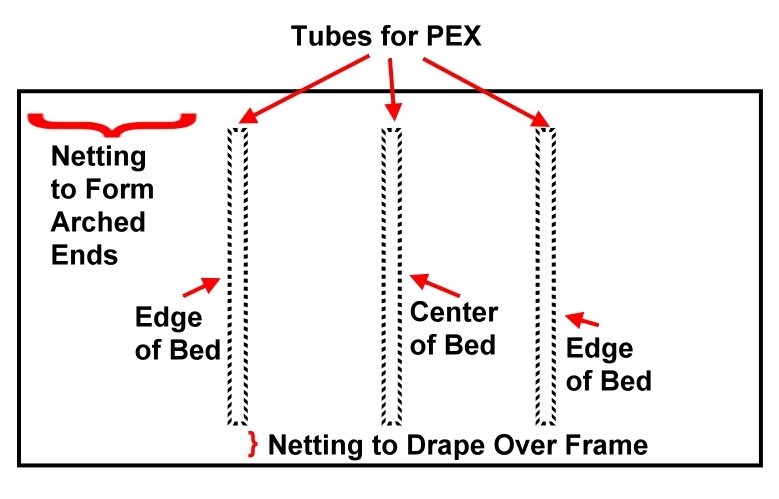 That is when I learned about PEX pipe, which is similar to PVC but much more flexible. One of the options was pre-cut 5 foot lengths which I could easily bend into arches I needed to fit into the raised beds and I thought that length made a good sized arch over the bed so I bought enough to make up a prototype. sliding down by the screw right below the clamp. The mosquito netting I purchased is 6 feet wide and the PEX is 5 feet long. My plan was to sew tubes to slide the PEX through to form ribs along the netting. 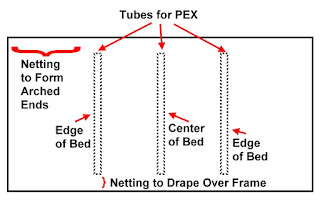 With the netting being longer, I was going to have it drape over the outside of the bed while I attached the PEX to the inside of the bed frame as the arched PEX would be applying pressure outward. On my prototype, I screwed half-diameter pipe clamps to the inside of the raised-bed frames and slid the PEX arches into those. I partially drilled a screw into the frame below the clamp to stop the PEX from sliding further down into the bed. This worked okay, but the arches were a bit floppy, Alan had a better idea. He cut a few of my tomato stakes in half and I drove them into the dirt at the edges of my raised beds where I wanted the arches to go. Over a foot of the stakes remains above the dirt line when they have been pounded in, so when I slide the PEX arches over these stakes they are much more sturdy that the ones held by the pipe clamps. berry bed cover for this year. As for the ends of the netting arches, I didn't feel the math had to be that accurate (yes, I hear all those that know me gasping!). I simply cut the netting rectangle going over the length of bed long enough so that each end would drape down past the top of the raised bed. I had used some mosquito netting for berry covers last year but had secured the bottom around the beds with bungee cords which had torn the netting. This year's ah-ha! moment was pool noodles. I went to the dollar store and bought an armload of them (all one color, of course). I cut the noodles so I had pieces the length of each side of the raised beds, sliced each noodle-piece lengthwise just through to the center hole and then used these as clamps to hold the netting snug along the entire length of each side of the bed. Once I had the noodles in place on the arched ends, I trimmed the netting along the bottom of the bed. of lettuce leaves, and a few blackberries, ready for dehydrating. As for the rest of the north garden, almost everything is doing quite well. I can't believe both types of lettuce are still going strong with no signs of bolting (going to seed). We have had a cooler, wetter early summer but all that means is that we are in the 80's and have had only a couple of 90 degree days. I pick leaf lettuce every 2 to 3 days and get about 100 leaves each time. Fortunately, I have come up with a way to dehydrate it that keeps it intact for winter storage and that the rabbits like to eat. Individual lettuce leaves are too thin and fall apart when dehydrated, but I wash them off and layer 5 or 6 together in stacks on the trays. They compress when dehydrating to form 'lettuce patties' and I have taste tested them on the rabbits. All four breeders have approved of these in their food bowls. I have also been harvesting a lot of herbs out of the north garden, you may recall this garden has a lot of plots for rabbit food. As soon as the basil and lemon balm were tall enough to begin harvesting I started cutting sprigs aggressively to encourage the plants to become bushier and heartier. Most herbs will branch out if you prune a stem directly above a leaf pair, so I carefully slide the blades of the little nippers that I use down along the stem until I come to a pair of leaves and that is where I cut off a sprig of the various herbs. Then, within a few days there will be a 'Y' forming at that point on the stem as the plant branches out to become fuller. Three of the herbs beds, Thai basil, lemon balm and cinnamon basil. The first two were scatter planted the last was planted in two rows. Heavy rains right after planting washed the scattered seeds around. You can see my bed of crimson clover looks like it has been ransacked. I let it flower thinking that my bees would enjoy it, but alas, none of the girls came to visit it. I googled and the bees are supposed to like it, but the cover was becoming so overgrown in the bed it was dying underneath so I recently cut it back and am drying it for the rabbits. Yes, I am making my own hay manually. By opening up the upper layer of the bed I am expecting the under growth to green-up again and I will get a 'second-cutting' as we hay farmers call it. And just look at the Seven Dwarfs! Our seven dwarf fruit trees have all flourished since we planted them this spring. They did not flower after planting so there will be no fruit this year but we are seeing a lot of growth. Our raised-holes seem to have worked well in providing a good start as they become rooted in the garden. We had a week of fairly strong winds and everyone remained firmly upright. I continue to water them, but not as often as I water the plants in the north garden. A couple weeks ago I did notice that almost all the trees had squiggly holes eaten in their leaves. I could not find the culprits making swiss cheese out of our fruit tree foilage, but I gave the trees a dusting of diatomaceous earth, one of my gardening staples, and that has seemed to taken care of whatever was munching on the leaves. Diatomaceous earth is made from the fossilized remains of tiny, aquatic organisms called diatoms. It looks like a fine white powder to the naked eye, but if you were to look at it under a microscope it would actually appear very sharp and jagged. To soft bodied critters that attack my garden, it becomes an impassable land mine field I lay down! Remember when you were a kid and played 'the floor is lava'? Well in this case, I play the leaves are covered in spikes with all the pests that want to eat them! What have we missed in the garden...Oh, the Russian Red Kale is gone. It became so buggy I didn't even bother with the diatomaceous earth. I pulled it up and discarded it outside of the garden. I am going to plant a fall crop in that bed in another month or so. The Black Beauty Zucchini have also been a disappointment, can you imagine planting zucchini and not getting any squash? The plants look like Medusa with lots of leaves and blossoms sticking up on about foot long vines but not a single blossom has produced a squash yet. My new winter squash I am trying out in this garden are not doing well either, but I now know the reason for that and it is my fault. I will tell you about it as we head over to the bottom garden as I am having the same problem with some squash over in that garden as well. So, the Sweet Meat squash in the north garden as well as the Tromboccini squash you will see in the bottom garden were both new for me this year. Both were growing well and producing lots of blossoms but when the young squash started coming on many of them quickly began rotting on the end and turning yellow. It reminded me of blossom end rot which I am familiar with in tomatoes, and sometimes peppers, but not in squash. I googled and learned that it can occur in squash, and just like tomatoes it is cause by a lack of calcium. With my tomatoes, I have always sprinkled pulverized egg shells on the dirt around the bottoms of the plants. Watering and rains then slowly release calcium into the ground from the egg shells. I also make sure to include egg shells in the compost that goes out to my worm farm so calcium eventually makes its way into my worm juice fertilizer. Cooking egg shells to make calcium water. letting the shells soak in the water over night. There is no way to reverse the blossom end rot that has already occurred, those squash had to be removed . I did cut off the rotted end and fed the remaining part of the baby squash to the rabbits. And, as usual, the girls liked the squash, the boys did not. There were some suggestions to help prevent the end rot from occurring in new squash being formed. The one I decided to try was to use a calcium foliar spray which is a direct spray onto the leaves. I made a solution of calcium water by boiling crushed egg shells in water and letting them sit over night. I then strained the concentrated calcium water into a bottle. I had no idea of the strength so I just made a guess and diluted it by half in a spray bottle and I sprayed it on the leaves of my squash and tomato plants. After doing this, I realized I should have spritzed just a sampling of plants first to make sure there were no adverse effects from the calcium water on the leaves. The next day I stepped out onto the deck and the only squash plant I could see from the deck, a zucchini in the kitchen garden, had all yellow and brown leaves and was definitely dying! But all the tomato plants were still green. I quickly checked the squash plants in the bottom garden and they were fine as well. It was just coincidence that a vine borer had gotten into that specific plant at the same time and killed it. Phew! squash so far this year. Oh yeah, I said the blossom end rot was my fault. I already knew that blossom end rot was caused by a lack of calcium, but during my research I discovered that an over-abundance of nitrogen can cause calcium deficiency in plants. When I was mixing up my dirt for my new planting areas this year I added lots of rabbit manure, which means lots of nitrogen. My hypothesis was further proven by the fact that if you look at the the other variety of squash here in the bottom garden, the Candy Roasters that I plant every year, they are not suffering from blossom end rot. This variety was planted in dirt that had already been in place, not freshly mixed this spring. I added a little rabbit manure to the tires of dirt, but it is at a much lower percentage than the manure in the dirt mix I was making to fill new beds and planters this year. So, a new lesson learned. As we entered the bottom garden you couldn't miss the cover I made for the grape vines this year. The two grape plants are in plastic totes on either end of a 16 foot feed lot panel - the same as we use for fencing in the gardens. The vines of the two grape plants then grow along the fence towards each other. Last year something ate all of my grapes in one day just a day or so before they were ready to pick, so this year I wanted to come up with a way to protect them. I needed a cover that would enclose the grapes because I am not sure if it was birds, squirrels or some other critter that absconded with them. The plan I came up with was for a cover made from mosquito netting that would drape over the feed lot panel 'trellis' and be sealed shut on all sides. I started with a 18 foot length of netting. With the netting being 6 feet wide, I measured the height I would need to cover from the top of the planters to the top of the fencing and determined that folding the netting in half lengthwise (draping 3 feet on either side of the fence) would give me enough length to cover all the vines. I had just seen a bunch of sew-on Velcro strips on clearance at a fabric store so I purchased enough to sew along the 18 foot length and the two 3-foot ends. As I was sewing it and then assembling it over the grape trellis I was thinking that there had probably been a better choice then Velcro along all those edges because the 24 feet of Velcro hook tape kept snagging and sticking to the mosquito netting and I had to carefully pull it away from the fabric. But in the end, it all fit nicely over the grape vines and I am pleased with the results. The 'envelope' cover for the grape trellis. I used pool noodles to encase the top of the wire fence panel. Strips of sew-on velcro close the sides and bottom . However, we do have another issue with the grapes this year and it is not just us. Another person in our self-reliance group asked me how our grapes were doing because his were turning black on the vine, shriveling up and falling off - all long before they are ripe. I told him some of mine were getting black spots but it did not sound as bad as his. Lest week it had got to the point that it was affecting about a quarter of my grapes. Back to Google and I learn this is Black Rot, but at least it is not my fault this time. Black rot is a fungal disease that is most prevalent in warm, wet seasons. It spreads easily, so if it appears you need to remove all signs of it in order to try and save the remaining crop. So, last week I unvelcro-ed the cover, folded it back and used my nippers to remove all the damaged grapes I could find. I am going to go back in a few days and repeat the process. Hopefully we will save some of this year's crop. Remember I said it wasn't my fault? I was being a little generous. In my googling I learned that proper pruning and thinning will greatly help to prevent black rot. As I did not do this, nor know how to do this, I have bookmarked this page and will be learning how to properly prune my grape vines this winter. Behind the grapes, that bed with the box-shaped berry cover has more blackberries. I am going to transplant them this winter because the elderberries to the left are blocking the sun way too much. I underestimated how much my elderberries would grow, they are about ten feet tall. That plastic ring to the right of the blackberries has a second variety of elderberries. It does not grow as tall, but this year it self-propagated to the raised bed to the right. That bed had a couple red raspberry plants I had rescued from a clearance rack, one died and the other had no berries this year so I am going to transplant it this fall and let the elderberries stay in that bed. Basically, the bottom half of the back row of this garden will now be elderberry canes. Unlike the blackberries and raspberries that only produce on second year canes, the elderberries produce every year but after four years the canes tend to produce less and you should thin them out then. So I need to come up with a system for marking my new canes each year to track their age. the fruit in their paper-like wrappers. Both of the ground cherry beds at the bottom of the garden are doing well. The bed from last year had many small groupings of seedlings coming up this spring from cherries that I had left in the bed last fall. As each cherry is filled with seeds, dozens of seedlings pop up where I had pushed each cherry into the ground. Just like with the herbs in the north garden, I found myself transplanting larger seedlings in each group to give smaller ones a chance to grow as well. 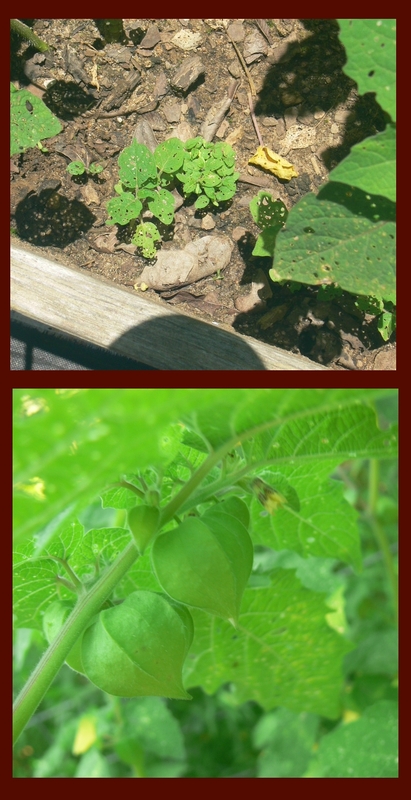 The bed of plants that self-seeded from last year is just starting to drop ripe fruit so I am going to move that berry cover from the blackberry bed over to the ground cherries. Last year something, I think squirrels, started eating the ground cherries as they ripened. When they are ripe, the ground cherries drop to the ground. They look like little paper Japanese lanterns and the yellow 'cherry' is inside. I kept finding the empty paper like shells on the ground as the critters stole the cherries out of them. That is when I made the original berry cover that is now on the blackberry bed. It is taller then the 'covered wagon' style and that is why I want to use it on this bed as the plants are quite tall. I will be moving the covered wagon cover from the north garden to the other ground cherry bed once I think they are all pollinated. I planted that as a new bed this year so they are a few weeks behind the established bed. The arched cover should work with this second bed because I did not fill the bed to the top with dirt as I did the first bed. The plants sit about 8 inches down in the bed so the cover does not need as much height above the edge of the raised-bed. frame. bed. I plan on saving seeds from this gorgeous plant. My various beans and cow peas are growing like crazy. I won't have anything to report on them until harvest, I pick them all after they dry on the vine. For the beans, I need to remember to track the amount I get from each bed as I am experimenting on the density at which I planted seeds this year. Oh, I do want to point out that large zinnia growing in the middle of my rice cowpea bed. Ever since we processed our rabbits, we have this saying that keeps popping up about various tasks I am doing. In this case the saying is "I can butcher my rabbits but I can't pull the zinnia out of my cow pea patch." Besides, my bunnies love to have zinnia flowers as snacks. Now there is some convoluted thinking. A sample of some of my St. Pierre tomatoes. tomatoes across all six varieties planted. And then there are my tomatoes, another problem child this year. I never have full, lush tomato plants and I believe this is because I always grow them in containers so their roots are limited to the pot size. I do use very large pots, most are about twice as large as a 5 gallon bucket which is what many people grow tomatoes in. This year I did not fill the extra-large pots all the way, but they do have more dirt in them than a 5 gallon bucket would. I started noticing problems this spring when my tomato plants started getting yellow leaves with brown spots at the bottom of the plants. My friend,Google, once again found the answer for me. It seems my tomatoes may have been suffering from root rot. Root rot is caused by over watering, but it was not my fault this time (really)! We had a very wet spring and the dirt did not get a chance to dry out between storms. Unfortunately there is no fix for root rot, you normally toss the plants, treat the dirt and start over. However, I decided it was time for some more experimentation to see if I could still get a crop from all these tomato plants. not have good results last year. I had been reading how Epsom salt (specifically the magnesium in it) is very good for many plants in the garden. In fact, when I purchased a box at the pharmacy the first thing I noticed was that one entire side of the box was dedicated to directions for its various uses in the garden. I sprinkled a couple of spoonfuls around each tomato plant before the next time they were watered and I also trimmed away the dead and almost dead leaf stems at the bottom of the plants. And remember, I also used the calcium water spray on their leaves as well to negate the abundance of nitrogen from the rabbit manure in this year's dirt mixture. As you can see I have lots of green tomatoes on all four varieties I have in this garden and so far none of them have blossom end rot from too much nitrogen. Cover #7 - More Nitrogen, Really? The roma tomatoes are suffering a lot from root rot. tomatoes to ripen that they have set. However, I do keep getting more dying leaf stems at the bottom of the plants. Hopefully I will have enough viable green leaves to keep the plants alive until all the tomatoes ripen. As more and more leaves were dying from the bottom up I really wanted to find something that would help. More googling suggested adding nitrogen...really? Well, maybe I could make it a balancing act between nitrogen and calcium water. I hadn't applied worm juice in a while, which contains both nitrogen and calcium, and is more of an all-around plant food so I opted for one more experiment. A couple days ago I gave half of my tomatoes a dose of worm juice and the other half a placebo (I watered them). I wish I could have made it a double blind test, because knowing which ones got the worm juice I am talking myself into the fact that they are looking a bit better. And as we head up to the kitchen garden you will see the Amish Paste tomatoes which are my favorite. They are the only ones that were showing signs of blossom end rot and it was only on these first two plants by the gate. I am going to give them all another spray of the calcium water for good measure, but I have tons of green tomatoes right now. In fact, I need to tie up a few of the branches as they are being weighed down so much I fear they are going to break off at the main stem. The strawberries are also going strong. I am getting more off the Ozark Beauties now than I did in the spring. They were slow starting out because I had transplanted them to the pallets. They spent the spring growing their plant structure out more than growing fruit but now they are fruiting like crazy. I had covered them with mosquito netting to protect ripening berries, but then realized I needed to uncover them every so often because there were a lot of new blossoms that needed to be pollinated. Well, there you have it, another long winded tour of our gardens with explanations of how everything is kept undercover and hopefully safe and protected from various garden hazards. Well, everything except me, sometimes I want to crawl under the berry covers, too, to escape the mosquitoes.